The pressure adjustment sets that amount of pressure that the presser foot will exert on the fabric. Downward pressure on the presser foot, holds the fabric between the feed dog and sewing machine foot. The amount of pressure would need to vary if you were switching between lightweight sheer fabric and multiple layers of denim for the machine to feed the fabric evenly. If you find that the fabric will slip when the presser foot is down, you need to increase the pressure on the presser foot. If the fabric is held so tightly that the feed dog is unable to move the fabric, decrease the amount of pressure on the presser foot. If one layer of the fabric warps or moves along faster than other layers, adjusting the pressure adjustment will usually help all of the layers feed evenly under the presser foot. Where Is the Pressure Adjustment? On most sewing machines the pressure adjustment is on the top of the sewing machine above the needle area of the sewing machine. 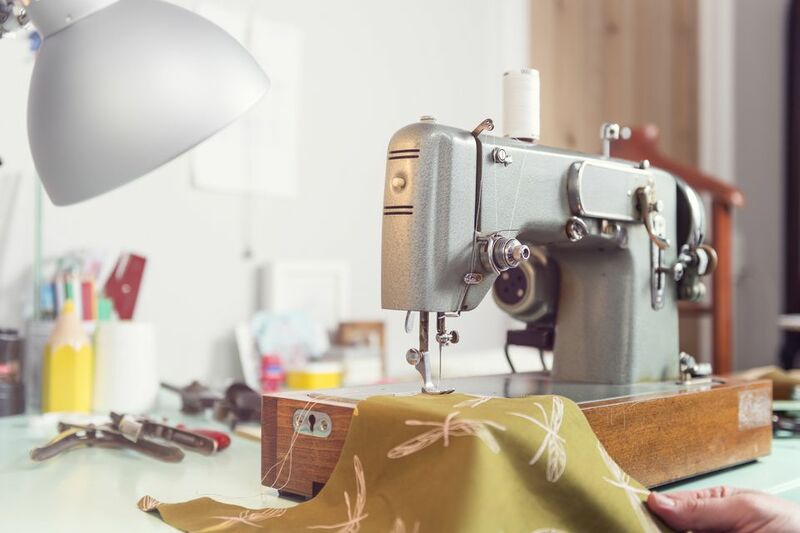 As with everything about sewing machines, the manual that came with your machine or a replacement manual for your sewing machine is the best guide to knowing exactly where things are on your sewing machine. Adjusting the pressure on the presser foot does not always solve the problem. An Even Feed Foot or a Walking foot is your next line of defense to make layers of fabric feed evenly under the presser foot. At times, fabrics such as vinyl will stick to the presser foot and not feed properly. A Teflon foot or tissue paper over the vinyl can solve the problem. What Is a Sewing Machine Zipper Foot? Do You Know What a Sewing Machine Take-Up Lever Is and What it Does? Turn That Old Sewing Machine into Something New!